Chivalry coffee table, Balsamic bedside tables and a Mustard Seed Yellow coat rack. Here are some oldies but goodies. I can't believe I haven't shared these yet! Sorry folks! 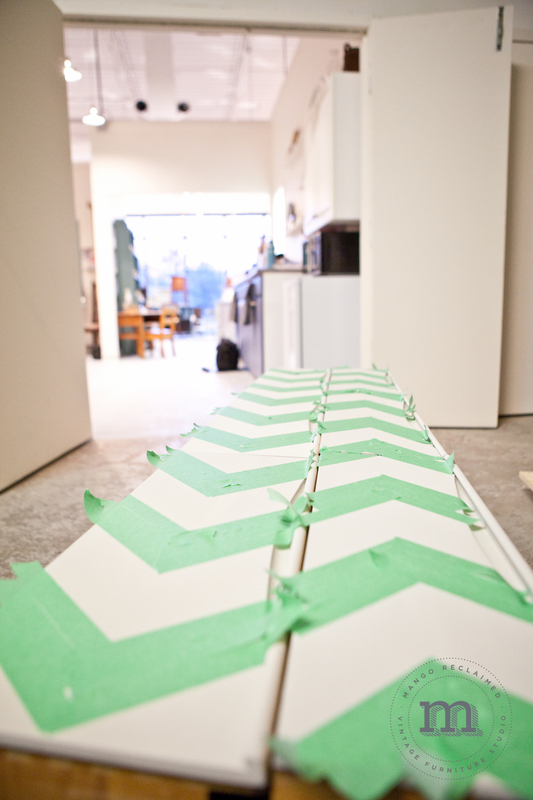 These are a few custom orders we did a few months back, starting with this hexagon coffee table. What once looked dated now looks elegant painted in van Gogh 'Chivalry'. Mild distressing overall followed by a combination of natural and french caffeine beeswax add some character and warmth to this beautiful cool grey colour. These bedside tables were quite honestly a bit of a challenge for me. 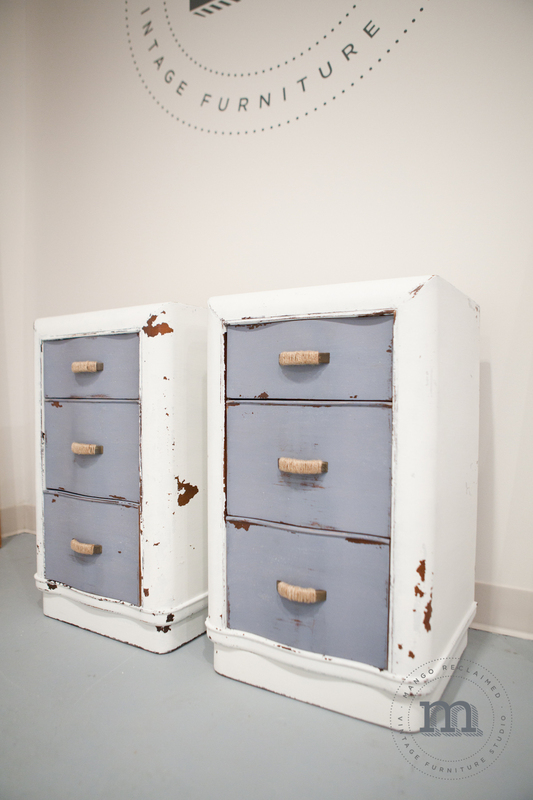 They were selected to be custom restyled from our inventory for their low profile and ample storage. I do love the lines of them - (we still have the long and low dresser and mirror available if your interested - or if you just want to see what these looked like before). It's not often that I am asked to paint pieces out in brown so I was a tad skeptical, but the van Gogh 'Balsamic' with french caffeine beeswax really makes these bedside tables look rich and I love how they turned out! Lastly for today is this hall tree that we had in the studio. Originally I had been using it to hang bags and merchandise by the checkout but when a customer asked if it was for sale, I said 'of course'. They requested it be painted in Mustard Seed Yellow from the Miss Mustard Seed Milk Paint line which is a colour that I truly love. Once complete my customer provided their own hooks to be added as well as some sweet smaller hooks so their grandchildren could hang their coats as well. Love! Thanks for following along! If you have something you would like restyled or would like to learn how to restyle your furniture yourself I would love to hear from you! Share day! Here's a peak at some of the inspiring projects you have been working on - thanks for sharing! 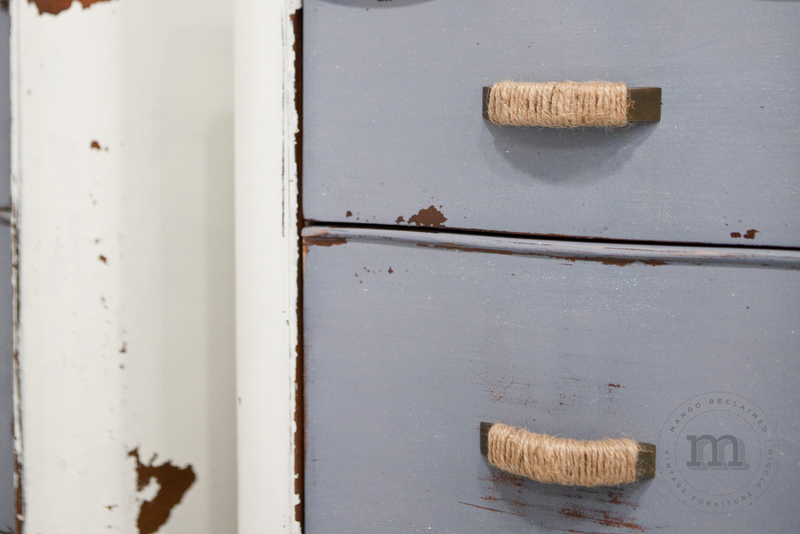 First up, Ahsley restyled this cute little dresser after a trip to Mango Reclaimed - great styling Ash! Ashley also restyled this adorable cupboard over the summertime - I wish we could see the whole finished piece because I LOVE the colour! 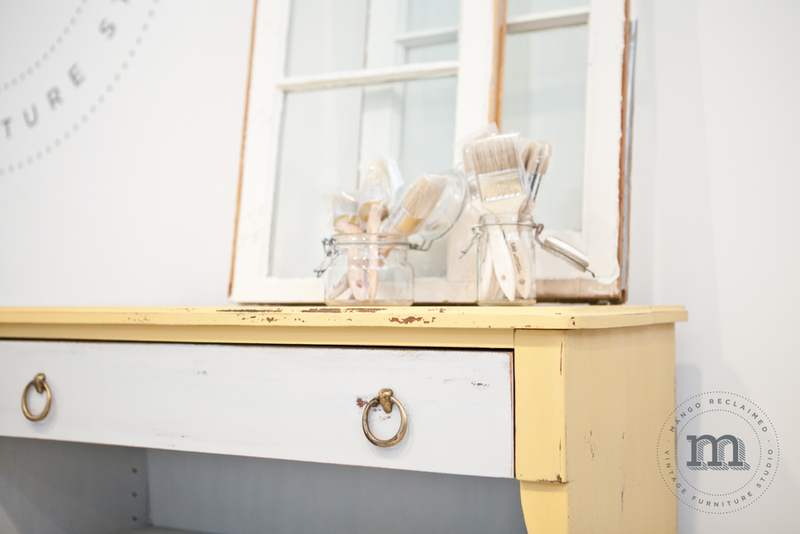 Liz attended a van Gogh 101 workshop recently and promptly went home to restyle this cute wash stand. It looks light and fresh painted out in van Gogh's 'chalk'. Nice work! Some people restyle from bold to neutral and some like to restyle from neutral to bold - I love it all! This sideboard was restyled by Lee using Miss Mustard Seed's Milk paint in Mustard Seed Yellow and now makes a bold and beautiful statement in her home! This was Lee's first crack at using milk paint, and although she was presented with a few challenges, the result is stunning! Thanks for sharing Lee! Hello! Some of you may have been following us along on Facebook or Instagram - if you have, you will know that I have been working away on another custom restyled dresser. This 9 drawer dresser was handed down the family line when it came to rest in my customers spare bedroom. With an idea for the type of look she wanted to create, my customer brought in the dresser with an inspiration picture which she found on Pinterest and came from this post over at 'A Little Glass Box'. I loved the idea my customer was going for and was excited to tackle a chevron patterned dresser! 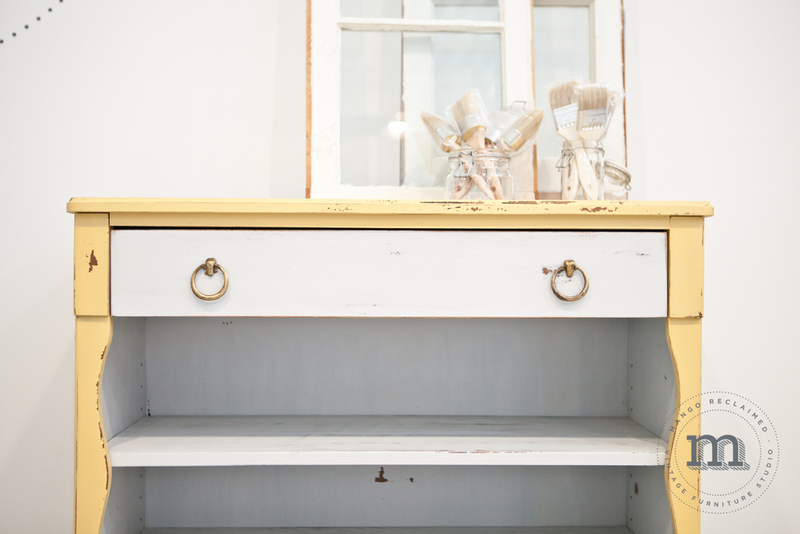 We collaborated on colours in the Miss Mustard Seed Milk paint line and decided on using 'grain sack' overall with a 'mustard seed yellow' chevron pattern for 6 of the nine drawers. This dresser has recessed handles built right into the drawer fronts, which means we didn't need to add any hardware that would have distracted from the design. Here's how we got there. 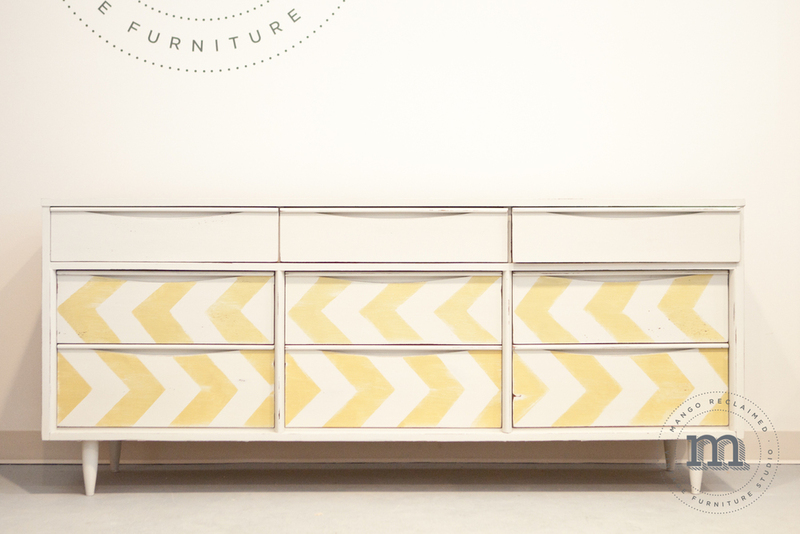 A short slideshow of the 'how to', showing the dresser as it arrived, after being sanded cleaned and prepped, the first overall coats of milk paint, the taping out of the chevron pattern and the final product. 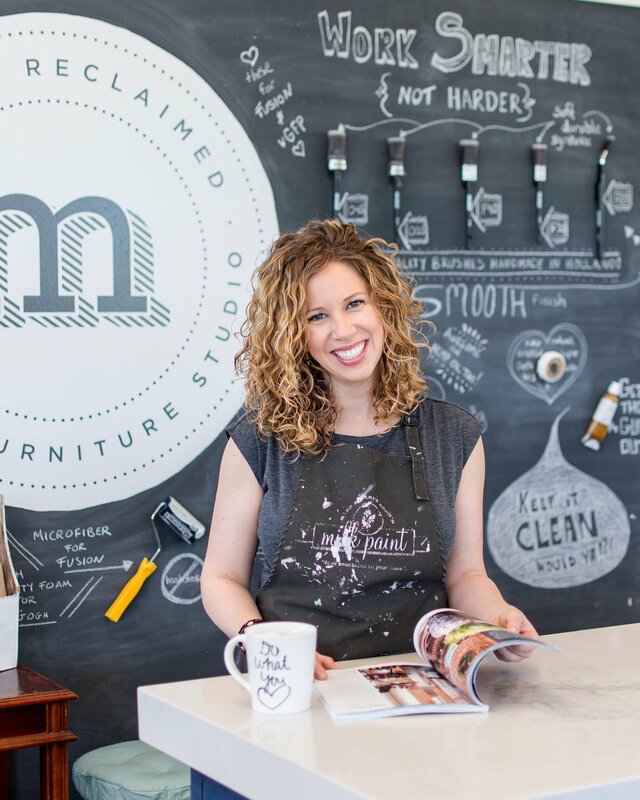 Do you have a piece of furniture you would like restyled? Contact us to see what's possible. How's your holiday shopping going? If you're like me - you're only about half done at this point . . . it's so hard to find the time! Don't panic, it will all come together as it should - it usually does. How about a few pretty pictures to calm your mind. . . I love this shelf! 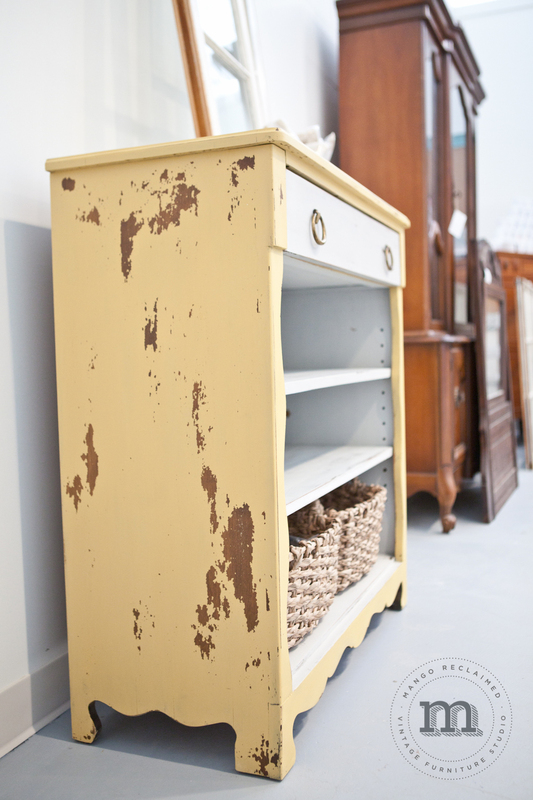 Milk painted in Mustard Seed Yellow and Grain Sack it's perfect for just about any room in the house. Seriously. 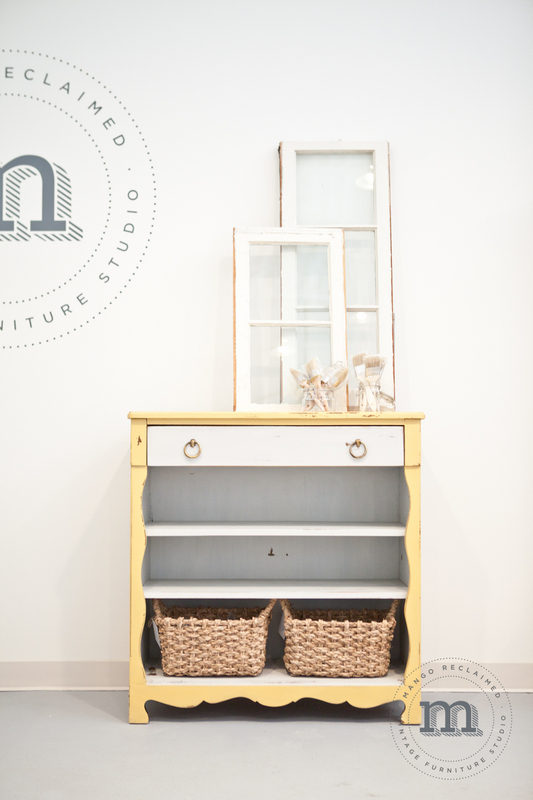 A beautiful pop of colour in your entryway (with storage for keys, mitts, shoes) . . . stylish storage for towels in the bathroom / linens in the hallway or laundry room / dining room platters and dishes / toy storage or even as a change table in baby's room. Ok, now how about these bedside tables? 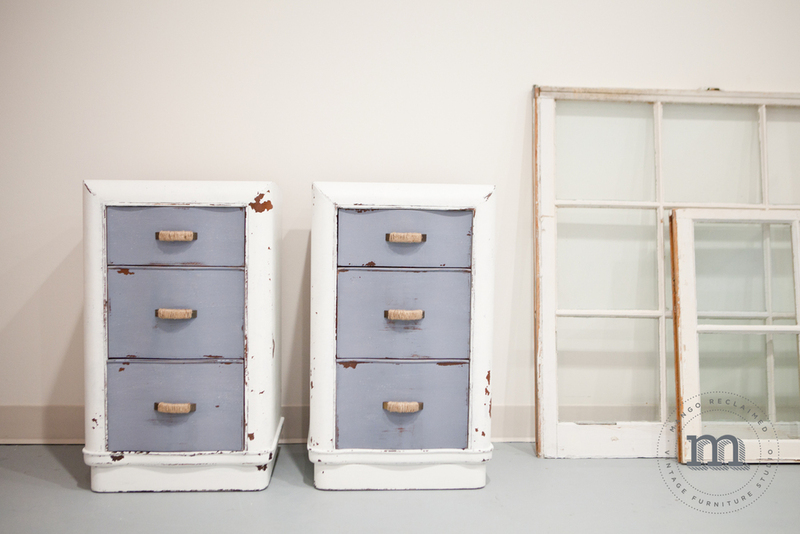 Again milk painted and beautifully distressed in the chippy awesome way that only milk paint can do. These stunners are 50's era solid built bedside tables with plenty of storage. 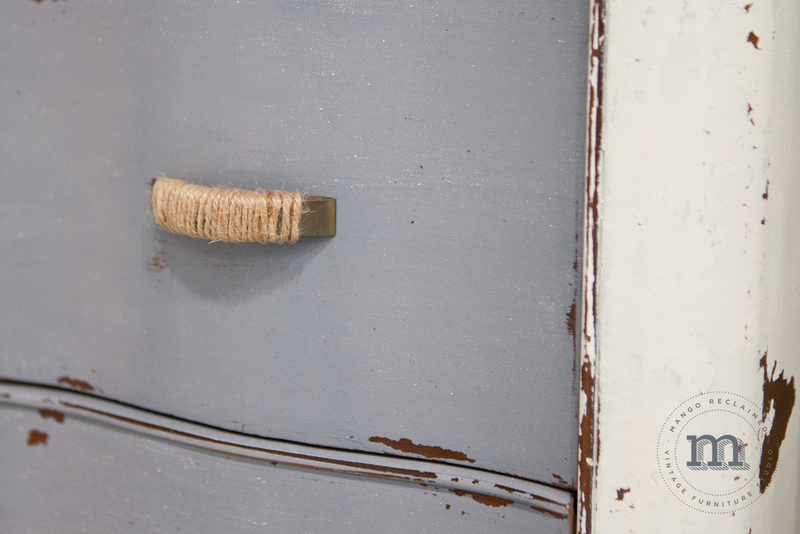 They've been painted in Ironstone and Dried Lavender, and the original hardware was given a restyle using twine to soften the look. Love! These pieces are all currently available at Mango Reclaimed - for more available items, please check the 'our work' section.